“Does your child choose to play the cop or the robber? A Sith Lord or a Jedi Knight? Why choose to play the villain at all when you could choose to play a hero? 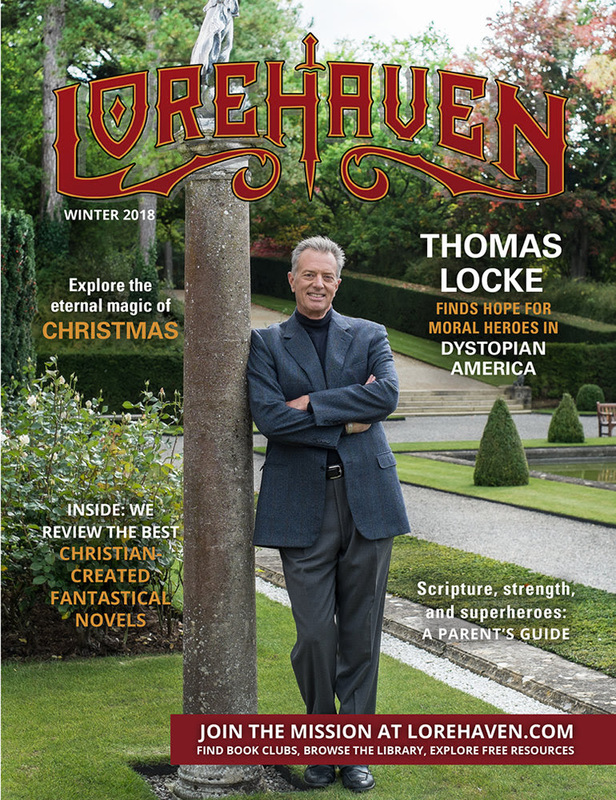 Thomas Locke shares his faith journey and creative motive behind his many fantastical novels, including his newest release, Enclave. We review Enclave, in which white-hat heroes in a corrupt frontier cope with the remnants of the now-decaying nation. Our team reviews the best Christian-created fantastical novels. 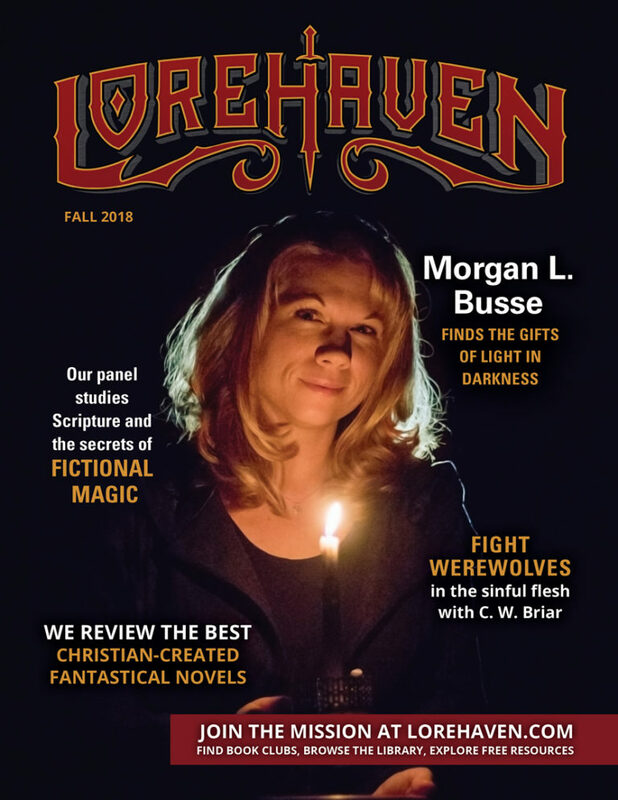 This issue also includes two sponsored reviews: Mary Ting's Jaclyn and the Beanstalk and C. S. Wachter's The Light Arises. Paeter Frandsen asks if Christian geeks might react like Spock and think of God (merely) as "fascinating." Marian Jacobs gives practical, biblical advice to parents of children obsessed with superheroes. Meanwhile, at the Lorehaven Book Clubs group, we're still hosting many of the authors featured in our book reviews. Staring in January, watch for more storytellers to arrive in the clubs and explore more at SpecFaith. Join the mission at Lorehaven.com. You can also browse our the LorehavenLibrary, which helps you find more than 900 Christian fantastical titles. Enjoy daily, free articles at Speculative Faith. 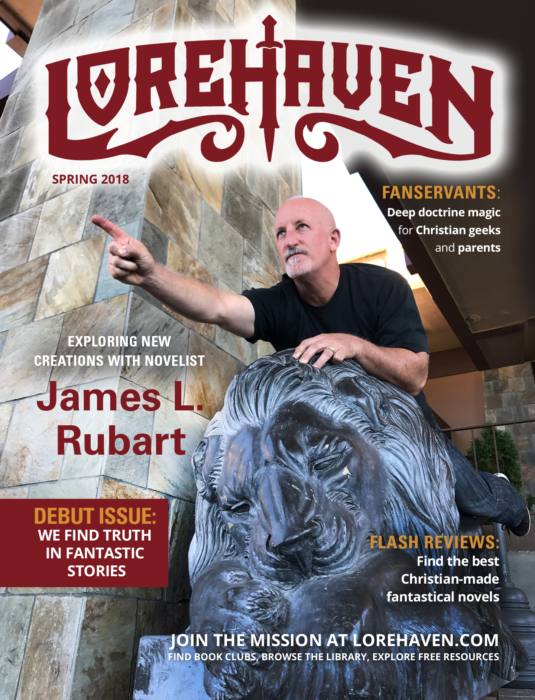 And be sure to share this magazine with your church, friends, family, and anyone else who would love to explore great Christian fantasy. Thank you for joining this mission to find truth in fantastic stories. Fantastic stories are capable of God-glorifying good, but also idolatrous evil. Affinity is a creative and original play on old concepts, and if you’re willing to take the ride, you’ll find it goes places. Here’s dreaming that fans can share in more stories like this. Morgan L. Busse’s fantastic realms challenge us to ponder our place in God’s world. In Christ, you are a holy, adopted, cosmic ambassador on a mission. The genre once known as ”fairy stories” sprang from biblical ground. Dark creatures personify our struggle against the sinful nature. Our panel explores how Christians discern fiction’s magical elements. 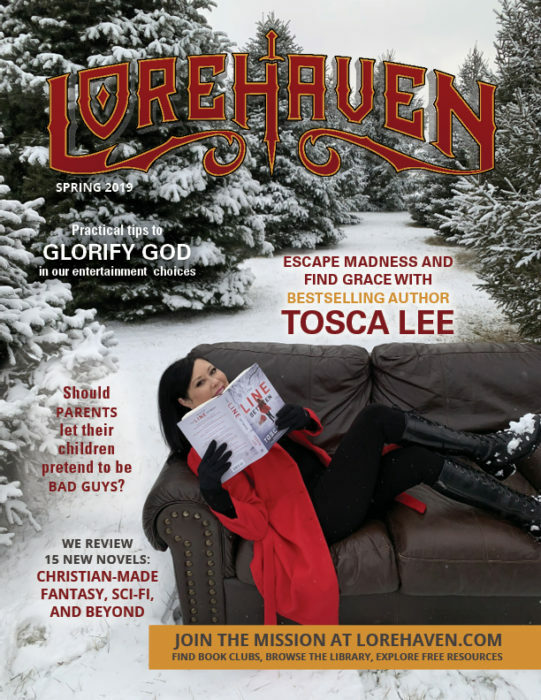 Lorehaven’s mission: to chase fantasy joys all the way back to their Giver. Explore the best new fantastical novels from Christian authors. Browse each title and learn more at lorehaven.com/library. Ben Wolf’s sci-fi actioner escapes the haunts of space horrors. Guy Fawkes’s 1605 gunpowder plot gets a color-magical twist. Nadine Brandes loves heroes who fight to find themselves in the color of truth. God encourages us to be kind and compassionate, even in our fandom fights. Fanservants: How Does Your Family Read Fantasy? Parents, try these tips to help children mature as fantasy readers. C. S. Wachter flings thematic windows open to sunlight and storms. Classic novels and films trace their fears all the way back to the Bible. All the realism and complexity of Journey into Legend wraps around an old, blazing vision. Aidan Russell creates action-driven fantasy of all the good old things. From the Bible to modern flood fiction, we keep encountering Noah’s Ark. Join the debate over hot topics based on biblical grace and truth. Our expert panel explores how Christians discern ‘bad words’ in fiction. “In Exodus 31 and 32, Moses ascended Mount Sinai to communicate with God. Meanwhile, the Israelites grew impatient for his return. So impatient, in fact, that they asked Aaron to make them gods to worship (Exodus 32: 1–6). They were like small children, quick to disobey when they thought the Lord wasn’t watching. And like small children, they needed structure and simple rules to point their hearts toward truth. As a theater major at a Christian university, I found myself stuck in the cycle of theatrical pride and low-self image. I sought to glorify God on and off stage but continuously fell short. So I quit. This is my story. Selfless Theater is a two part article featured on Stage and Story. Click here for part one and here for part two. I'm so excited about this new digital magazine, guys! In the Spring issue, you'll find my article, "What If Your Kids Don't Read Fantasy?" In the Summer issue, you can read the follow up article, "How Does Your Family Read Fantasy?" - Flash reviews of excellent Christian-made fantastical novels. - Book clubs to share these stories with friends and family. - Articles that glorify God while exploring human imagination. 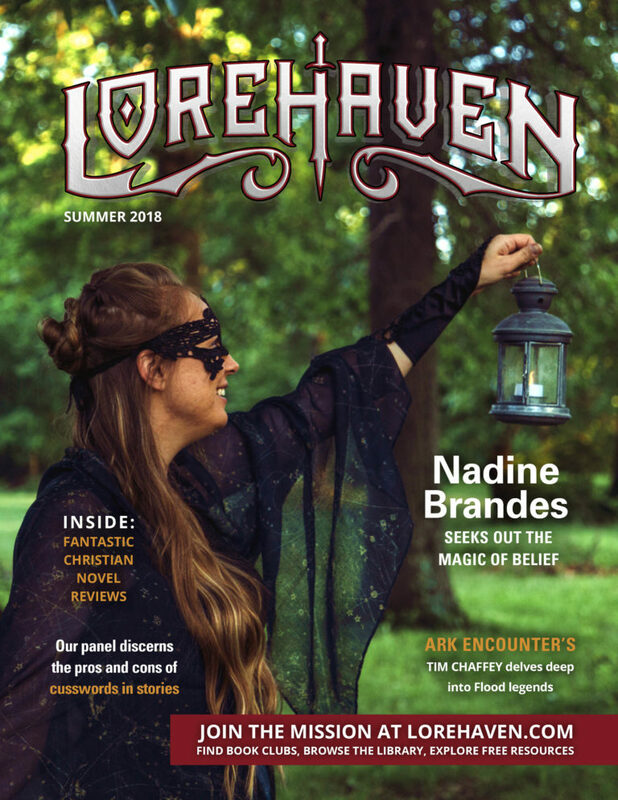 Subscribe today and get your free issue at Lorehaven.com! "Being a woman who struggles with lust can feel like being alone in a crowded room. You think you are the only one tempted when you watch that movie and read that book. Yet the opposite is true. We’ve been told that lust is when a man looks at a woman (not his wife) and desires her. That definition is both misleading and incomplete. If women don’t begin to redefine what lust means for them, they will continue to isolate themselves from each other, their spouses, and, in so doing, cripple their chances of overcoming temptation. . . ."
I recount a severe car accident that will impact my family and me for the rest of our lives. It was because of this ordeal that I experienced crippling anxiety for many years. After searching for answers to overcoming her fears, God provided them through continuous prayer and the council of a pastor. I was eventually able to see that my anxiety was rooted in idolatry. "It was August of 2009, an hour west of Flagstaff, Arizona. I was sitting shotgun in my boyfriend’s Jeep with his dad in the back seat, driving cross-country from southern California to Chicago. We were on our way to attend seminary, or so we thought. An hour after we stopped for lunch, both my boyfriend and I were overcome with sudden exhaustion. There would be no staying awake. I was woken abruptly by my boyfriend’s father urgently calling out his son’s name. I looked up just in time to see us drifting off the highway. The Jeep jerked right, then left, eventually sliding perpendicular on the road. The cruise control was still on, and we were traveling fast."